There are no coincidences. None. In a life built on faith, there is always a reason. Always. We don’t often understand the fullness of the incidence or of the reason, but just because we don’t understand, does not mean a reason does not exist. Today, my son brought this to me to begin working on it as a recitation during his homeschooling speech class. The photo of the poem is from his textbook. A coincidence? No … a God-incidence. I had to have seen this poem a few years ago when my daughter went through the same curriculum and speech class. I had to have seen it at that time. Why didn’t I recall it from back then? I’m pretty sure I didn’t recall it, because God hadn’t spoken it into a part of my heart until Sarah read it in our small group time. That’s when it spoke to me. It spoke then — that day in our small group, but I didn’t do much with it. I oooo-ed and aaaah-ed with the rest of our group about the meaning and the depth, but I’m not sure it really intersected with my heart at all in the days, weeks and months that followed. In my church yesterday, the pastor gave a message about being “good soil” from Jesus’ parable in Luke 8. There is a lot in common with bridge building and being good soil. With a heart filled with gratefulness to Him, I can say — because of Him — I am good soil. I’m grateful our Lord has given me a heart willing to be good soil, and I’m also grateful for all of those who have uprooted thorns in my life, pulled weeds, tended to my soil, nurtured it, planted the Word in it, and have spoken into my life at some point along the way. The last few months have found me struggling with the task of perseverance in my life. I’ve been called to persevere through some tough stuff, and it’s been wearing on me. The soil message was one I needed to hear. It reminded me that the tasks to which He has called me have a greater purpose He wishes to bring about. 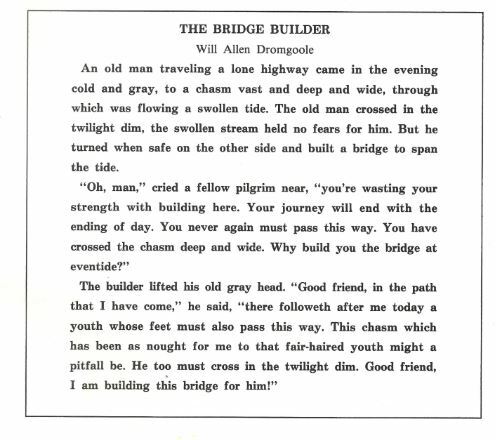 Yes, some of this is about me, some of it is about the others it involves, but the soil He is turning and the bridges He is building have a purpose for which He has not fully revealed to me. Happenings in our lives are woven together by the Master. Nothing is allowed to occur in our life without first passing through His hand. We’ll never know the reason for much of it, but when we can see glimpses of how He is weaving His story into our lives, it should awe us to no end. So when I struggle with perseverance, and when I happen to hear a message at church on Saturday night about the storms of life, and then I go to church on Sunday to hear a message about soil, and the storm and soil messages are reinforced on Monday by a bridge message, it is NO coincidence. It’s Him speaking something into my life that He wants me to hear. I recognize His presence and His weaving in the circumstances of my own life, and I recognize them in His calling on me to persevere through the storms, to maintain good soil and to continue building bridges for His purpose and for His will. I didn’t know that failing to put a fan in the greenhouse would give me weak stems on my tomato plants. I bought an 8′ x 6′ greenhouse this winter from a warehouse club. I figured it would give me an easier start at gardening this year. For the last few years, I’ve grown my tomato plants from organic seeds. 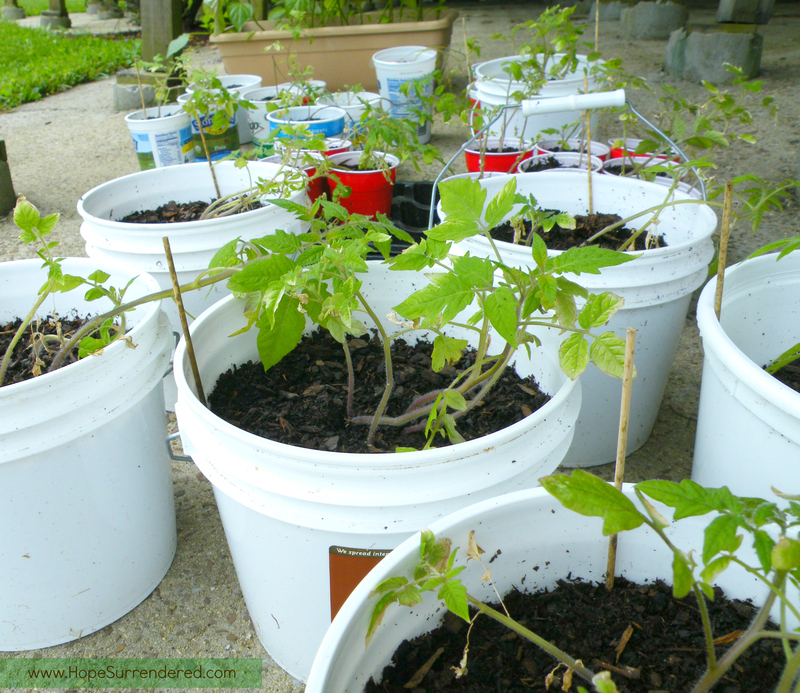 The process was an eyesore in my family room for a few months … the shelving, the 30 containers, the grow lights… The seed starting was supposed to have been easier with a greenhouse. I bought the greenhouse figuring the set-up in the basement would give the tomatoes a room of their own, and it would provide an environment where I could increase the heat and humidity to which they were exposed. I started 30 tomato plants and 15 pepper plants from organic seeds in organic soil, and I put them in the greenhouse. They all grew. I didn’t know I was supposed to put a fan in the greenhouse to simulate gentle breezes. All of my tomato plants now have weak stems. Weak stems weren’t something I dealt with when the seedlings were in the family room. I guess the air from the heat vent nearby was always enough to keep them moving. My tomatoes are now outdoors getting acclimated to the weather, and they’ll go into the garden this week since the nighttime temps are finally resting in the 60s. They have weak stems, but I’ll plant them deep into the soil, I’ll baby them, and I’ll have expectant hope for them to thrive. Sometimes I really dislike the winds I have to come up against in my own life. I’m fine with gentle breezes, but the winds … I feel as I could do without them. Winds…you know: challenges, problems, frustrations, heartaches. As much as I don’t like the challenges, they have made me stronger. Without them, I’d probably be weak — much like my tomato stems. But, I’m not weak; I am strong. Someone has planted that within me.